Enhancing your gaming experience, the Khazad-dûm expansion for The Lord of the Rings: The Card Game contains three new scenarios that players will be able to measure themselves against. In search of Balin and the traces of his recent dwarf colony, the heroes of Middle-earth will have to brave the dark and infested depths of Moria. In addition to powerful Encounter and Quest cards, Khazad-dûm includes two new Dwarf heroes and a wide variety of Player cards that will increase your ability to customize your game. Be careful this game is an extension of Le Seigneur des Anneaux: Le Jeu de Cartes and cannot be played alone. 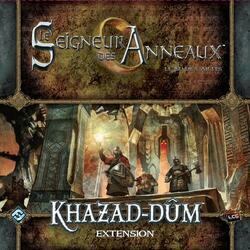 To be able to play it you must have a copy of the game Le Seigneur des Anneaux: Le Jeu de Cartes .